Some of my Sportlots purchases are trickling in. I love it when that happens. I snagged a couple of jersey cards for myself in the last round of purchases. This jersey card from National Chicle is actually the Bazooka Back version /99. I don’t have the base version, so I don’t know if there are any differences on the front. I kind of doubt it, because there really isn’t much t change on the front. These cards are starting to grow on me. The dark cardboard that is visible around the jersey cutout really adds to the vintage feel. The artwork is hit or miss. This drawing of Hamilton is squarely in the middle. Its instantly recognizable as Hamilton, but it doesn’t wow me. Its a very generic pose. I’ve got a bit of a baseball card itch back now. Hamilton and the Rangers are looking like they might make a run this year, and its fun to follow. Tom Verducci is preaching to the choir when he tells me how great Josh Hamilton is, but in case you were wondering – here’s his story on CNNSI.com. I picked up these cards as a gift from an excellent member (r2d2) on Freedom Card Board. 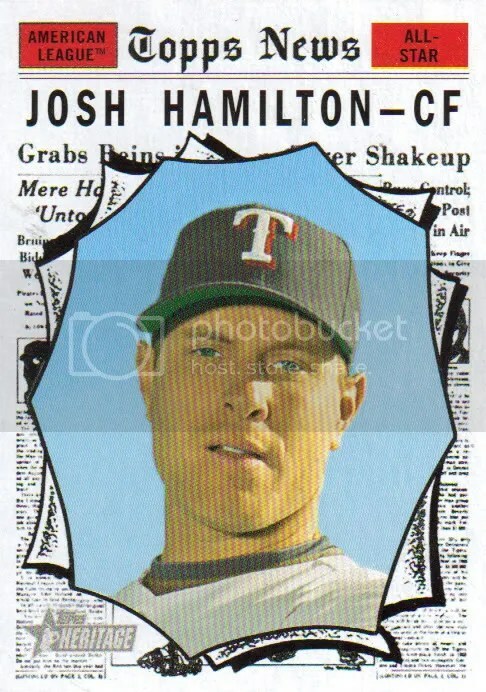 He had picked up team sets from some of Tampa’s minor league teams to get the cards of players he collectes, and then was left with a bunch of guys he doesn’t collect – including Josh Hamilton. Its been a bounce back season in a lot of resepcts for Hamilton, I wish I could say the same for my collection. 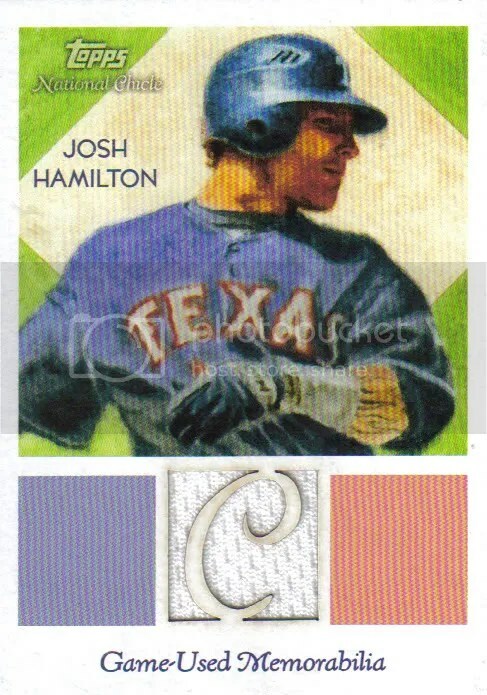 One positive for me is that I like the looks of Hamilton’s cards in A&G – and he finally has a Ginter jersey card! I am looking forward to picking those little guys up. On the field, it has been exciting to watch Hamilton. He seems to be well and truly back. He was recently voted to the starting lineup for the 2010 All-Star Game – again. He has declined to participate in the Home Run Derby, which I think is the right decision. 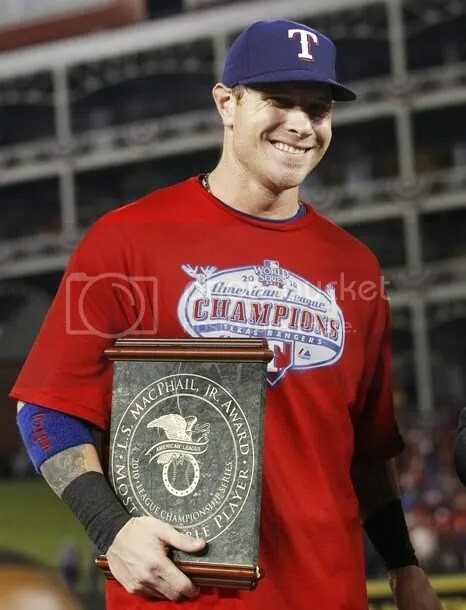 He doesn’t want to mess up his swing or throw things off for the second half of the season – a season in which the Rangers are gearing up for a potential playoff run. And really – is there a chance that he can better his performance from his last appearance in the HR Derby? I really don’t think so. 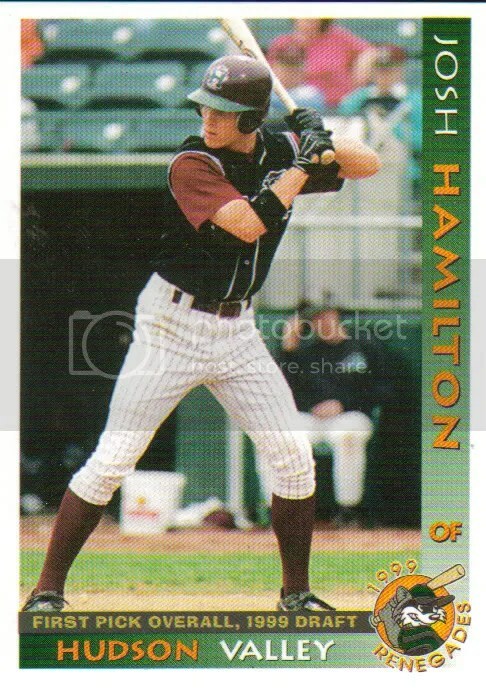 Hamilton’s appearance in the All-Star game will also give him a chance to do something that probably should have happened a few years ago – share the outfield with fellow 1999 draft pick Carl Crawford. Hamilton and Crawford spent time together in a few minor league stops before Hamilton derailed his life. They finally get the chance to play together in the majors. Yeah, like really, really hot. And still with all these Topps cards, I am just not feeling it this year. And yet – every so often, they keep coming up with a card or two that just won’t let me throw my hands up and walk away. Like the 2010 Bowman 1992 Throwback. My goodness, this is a pretty little card. Definitely going to be in my next purchase off Sportlots. 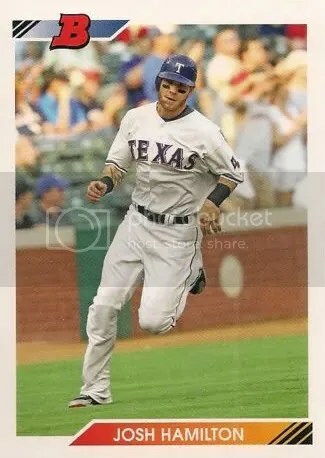 I am also holding out hope for Allen & Ginter, as long as Topps actually uses a new-ish photo for Hamilton, as opposed to the one they have recycled for the past couple of years. All-Star Weekend will be missing a little bit of drama as well – Hamilton declined to participate in the Home Run Derby. This will cut down on the amazing factor, but hopefully it allows him to keep his swing smooth, and will allow him a bit of a break to stay injury free. As of today, Hamilton has a hit in his game against theHouston Astros, so that extends his hitting streak to 21 games. He is batting .347 (.475 for the month of June) with 18 home runs and 57 RBIs. Josh Hamilton is heating up. It is a little bit more than 1/3 of the way through the season, and he has an average over .300, and should be on pace for 30 home runs and 100 RBIs. That is a really solid bounceback for him after a 2009 season that was injury-ridden and largely disappointing. 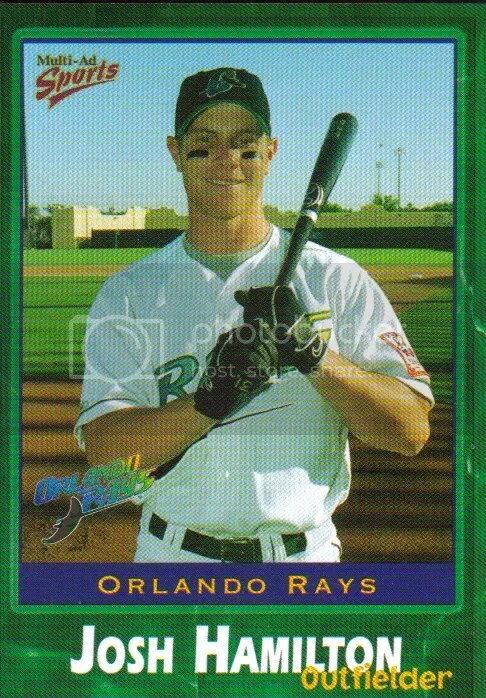 On a baseball card front – I am pretty disappointed with the 2010 product lineup. I am just not a huge fan of Topps. This entire card season has been anti-climactic, unless you are looking for Stephen Strasburg. I haven’t even been the slightest bit tempted to bust a box of 2010 baseball cards, and that is kind of depressing. I am still picking away at Hamilton’s cards (it is a never-ending task), but there hasn’t been a must-have product for me this year. I really think there should be more fuss over this particular insert set. These cards look awesome. So clean, and to the best of my knowledge they are actually a little tiny bit original. Sure, Upper Deck broke pretty much every legal and ethical rule available to them by putting out their baseball cards this year, but I haven’t seen a Topps card that I liked this much in a while.